This is my first exposure to Kay Arthur. I'm going to tell you right up front that I liked her style for about the first 3/4 of the book but the last 1/4 of it drove me a bit crazy because it seemed to be a walking advertisement for other Kay Arthur books and videos. I didn't care for that and not being sure whether or not that is her usual style, I will offer that disclaimer. On the whole though, I did like her. As long as she sticks to scriptures I think she's fantastic. It's when she starts plugging for herself that I start to roll my eyes. That confessed and stated, we'll move on. 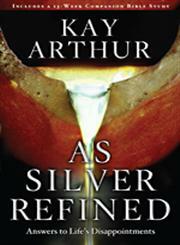 As Silver Refined : Answers to Life's Disappointments is a republication which now includes a 13-week study guide. (I say that only so that you aren't confused, thinking that this a new title. It isn't. But it has a few new materials.) I don't really want to make this blog post a walking advertisement either because we'll miss the point and I won't care to write the post if it is that. I'd rather focus on my own personal interactions and feelings in relation to this book. So without further ado . . . It made me cry. Actually, it made me sob and I was not intending to sob. I had a hard time reading this book and working it out internally. Now, we've had some hard stuff thrown our way in the last few years. A few years have been more unpleasant than I could possibly put into works. Nasty stuff. Bitter tasting. But I would say that we have seen the hand of God move in each thing and that I can say with absolute confidence that He is good all of the time. Sometimes it may not look like He is good - but He is. He is sovereign and He is good. I've not doubted His goodness but I did have some hiccups in my belief system. When reading As Silver Refined I was forced to think through my beliefs a little more heartily though and what I found inside myself was painful. Kay Arthur is big into the sovereignty of God (and she too has had her fair amount of life trials.) This book isn't about just simply coping when life starts to be a drag. It's about acknowledging that God sends the good and has to allow the bad (Satan cannot move without God's permission) and in all of this theology I have and do still agree with Kay. But she has this phrase that she uses throughout the book which caught me off guard. She frequently points out that "when bad things happen" we need to be able to say, "God, if this is good with You, it's good with me." As I'm writing this post, my very close friend here in town is going through her own trial with the health of her baby girl. (Her baby girl is the same age as my baby girl so this is kind of hard to watch. If you'd pray for the complete health of Baby A, that would be fantastic!) Though this trial is not my own, it is a (painful) reminder to me that God is still good all of the time and His ways are perfect. Even though something may look bad to us in the moment, it doesn't mean that it is. These trials are used to draw us closer to God, to make us more dependent on Him, and to learn to love Him more whole heartedly. He is not a bad God. He is a good God. He allows things that we do not understand. Just because we do not understand does not make Him wrong. It means we're finite. The problem with lack of acceptance is ours. Believe. That is all that is asked of you or required. Then, regardless of whether or not you like His way of working, He does indeed take care of the rest. So, Panic? I think we should not be friends. Worry? I need to say goodbye to you. Disbelief? So long, farewell! Fear? You'll need to leave. "And then, if you get quiet and listen long enough, you'll hear His whisper - maybe not in these exact words but with the same message: "In the world, you will have tribulation . . . " (John 16:33). He warned us. We will encounter trouble, He said. There will be disappointments; things will be hard. "But take courage; I have overcome the world." Christianity doesn't exempt us from pain, from disappointment, from the hardships of this life. Nor does it demand that we deny or hide our pain or our disappointments. But it does give us One who promises a purpose, an end, and a benefit in it all. Continual refinement. That's what it's all about. Like it or not. Take it or leave it. But if you take it, you'll be in the safest hands you could ever hope to know. I've encountered that at times in some books, where the author mentions his or her other materials a great deal. I think most times they don't mean it as self-promotion but as, "I've already written about this particular aspect here..." But it does rankle when it's done overmuch. I think there comes a time in every Christian's life when God does or allows something that doesn't fit in with our definition of "good," and it can be a real struggle to come to grips with. This refinement is one of the reasons He allows those things. It's a painful process, but we're so much the richer once we come out on the other side. Yeah...I think I'm with you (and most people) when we say that God will bring us through the challenge but not looking at it as good. This sounds thought provoking on many levels. And thank you for sharing so personally. Sounds like a book I need to read! My dh's boss has been through KA's Inductive Bible Study training and loves it. I've often thought I'd like to go and take the classes. I think I need this book. I've been through more pain and refining in the last 5 years of my life than in the whole rest of my life. It wouldn't have taken that long if I had been willing to submit to the Lord from the beginning. It's a blessing that you would post this today, as I was just thinking along the same lines, of knowing that God's plans in our lives are the BEST thing for us and those around us, not just good things, but the BEST. So hard to trust that, sometimes, though! Does she address questions of spiritual warfare (angel's delay in Daniel) as she addresses the sovereignty of God? I haven't seen anyone address both these topics together- it seems that the sovereignty of God folks ignore passages like Daniel 10:10-14. It seems clear to me that we don't know when what happens is "as God would have it be" and when it's part of a very real struggle between good and evil. Wow, that sounds so good! Makes me think of Jeremiah 26:14--"As for me, I am in your hands; do with me whatever you think is good and right." As we are going through our own very stressful and life-changing trial right now, this was just the passage my heart needed. I've done some of her studies, but never read a book by her; this sounds like a great one to read! Thanks for sharing! Thanks for reviewing this book. I have done a lot of inductive Bible studies produced by Kay Arthur's organization and most do not promote their materials (except for the mention of the IBS Bible in the intro because of all its charts and stuff). Almost all of the studies emphasize the sovereignty of God which has been a huge help to me in my own wave of trials over the past three years. This book sounds really hard, but really good. Such a profound question: why does a good God allow bad things to happen? And it seems this takes it one step farther. It makes me think though, that if he's allowing these things to happen I'm thankful for the things that Satan wishes to do that he DOESN'T allow to happen.